Does the Power Grommet have a cord that needs to be plugged in? The UPLIFT Desk Power Grommet has one cord that needs to be plugged in. So if you have two power grommets, you will need two wall outlets. If my desk has two grommet holes, can I add both a Wire Grommet and a Power Grommet? Yes, the Wire Grommet and the Power Grommet are just inserts for the grommet holes that come standard on many UPLIFT Desktops. You can stick with one type of grommet, or add one of each. What size of grommet hole is this compatible with? UPLIFT Desk Power Grommets will fit grommet holes that are 80 mm in diameter. This is the standard sized grommet hole on any UPLIFT Desk. How do I know if my desktop will support these? If you purchased an UPLIFT Desktop with pre-drilled grommet holes, then these will be compatible. Otherwise you will have to drill a grommet hole that is 80mm in diameter. Why would I need a Power Grommet? Have you ever sat at your desk and wondered what the outlet was doing underneath your desk instead of in your desktop? If you answered yes, then you have realized the ingenuity of an UPLIFT Desk Power Grommet! A power grommet insert offers the ease of having an outlet within reach on your desktop, instead of having to crawl under your desk when you need to plug something in. Should I get this or a Wire Grommet? The Power Grommet and the Wire Grommet fulfill different needs. 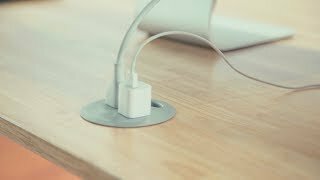 If you need quick and easy access to an outlet, go with the UPLIFT Desk Power Grommet. Choose the UPLIFT Desk Wire Grommet if you just need to organize and route your cords. Power Grommets come in your choice of black, gray, or white. Add a convenient source of power while maintaining the color scheme of your UPLIFT Desk. Magna est enim ex sunt deserunt cillum consectetur mollit ut exercitation occaecat enim ex. Et non et laboris nisi veniam aute cupidatat pariatur qui id adipisicing. Ad laboris id occaecat qui. Elit tempor adipisicing dolore deserunt labore voluptate aute sunt aliqua occaecat. Magna est enim ex sunt deserunt cillum consectetur mollit ut exercitation occaecat enim ex.